It’s magic! And the magic is being created by local talent singing alongside three professionals. The Magic Flute is directed by our own resident opera singer, harpist, and STARS faculty member, Karen Hughes. The show will be performed at the Soo Theatre on Thursday, Friday, and Saturday, June 28, 29, and 30 at 7:30 p.m. The melodic music for The Magic Flute was written a long time ago by Wolfgang Amadeus Mozart. The Magic Flute is a musical fairy tale of good versus evil. The Prince Tamino, aided by the comical bird catcher, Papageno, faces trials of courage, honor, and steadfastness. A magic flute and some magical bells guide them on their journey towards goodness and light. The character of the Prince Tamino is being created on stage by Chauncey Packer, who hails from New Orleans, LA and has performed at New Orleans Opera, Pensacola Opera, Tulsa Opera, Shreveport Opera, Opera Pacific, Mobile Opera, Nashville Opera, Atlanta Opera, Edmonton Opera, and the list goes on. Packer has also performed with the Grand Rapids Symphony and Grand Rapids Opera. Packer will leave Sault Ste. Marie and head straight for a European tour of Porgy and Bess. His incredible tenor voice soars, as he portrays the prince whose quest for love seems unattainable. Papageno, the comic bird catcher, is being played by Pittsburgh baritone, Jason Kaminski. He plays this part with ease and charm and his voice is warm and exciting to hear. Kaminski’s signature roles include Figaro in Il barbiere di Siviglia, Mercutio in Roméo et Juliette, Marcello and Schaunard in La Bohème, Dottore Malatesta in Don Pasquale, Escamillo in La tragédie de Carmen, Guglielmo in Così fan tutte, Dr. Falke in Die Fledermaus and Sid in Albert Herring. Kaminski has also sung for the Juilliard Opera Center, Virginia Opera, and Anchorage Opera. This is not Kaminski’s first trip to the Upper Peninsula, as he has sung with the Pine Mountain Music Festival in Houghton and has also been a resident artist at the Bay View Music Festival in Petoskey. Karen Hughes plays the role of the Princess Pamina. Hughes is a resident of Pickford, MI while performing throughout the year doing opera and concert work nationwide. Hughes has sung leading roles in Cosi Fan Tutte, Madama Butterfly, Die Fledermaus, Carmen, and The Marriage of Figaro to name a few. She performs regularly with the Sault Symphony Orchestra in Michigan and Ontario and has performed with the Tianjin Symphony in Beijing, China. A highlight of her career has been placing as a regional finalist in the prestigious Metropolitan Opera National Competition. This is not the first time these three singers have performed together. 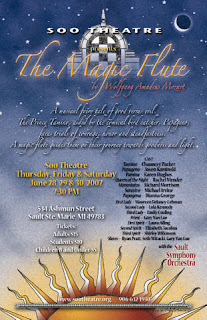 Packer and Hughes were in The Magic Flute together at Utah Festival Opera in 2002 and all three artists performed together the following season at Des Moines Metro Opera. Local singers have been coached by Karen to play other leading roles. Rachel Mender, well-known local actress, hits some impressive high notes as the Queen of the Night. Maureen Delaney-Lehman, Lola Kennedy, and Emily Couling harmonize beautifully as Three Ladies who work for the Queen. Pickford dentist Richard Morrison, who can always make the audience laugh, plays Monostatos, a servant of Sarastro whose loyalties are questionable. Michael Irvine, from Sault, Ontario, plays Sarastro and hits some impressive low notes. Dianna George, dance instructor at STARS, is also an actress and soprano. George plays Papagena, a comical part that displays her acting and singing talents. As Set Designer, Costume Director and all around collaborator, George has worked hand in hand with Hughes to create their version of Mozart’s masterpiece. Also in the cast are students Laura Ailing, Elizabeth Jacobus, and Shirley Wilkinson as the Three Spirits and LSSU student Gary Van Lue as the Priest. The narrator, who helps weave this story together, is played by James Couling. All of this is backed up by a chorus of local voices, several dance students, and the Sault Symphony Orchestra under the direction of John Wilkinson. It is truly a delightful experience to see and hear the music of Mozart performed in English on the stage of the Soo Theatre. The piece was originally written in German, but Mozart specifically intended for The Magic Flute to be sung in the language of the people. All performances begin at 7:30 p.m. Tickets are available at the Soo Theatre box office at 534 Ashmun Street in Sault Ste. Marie, Michigan. Call (906) 632-1930 for more information. Our Summer 2007 Newsletter is now available online. A PDF version is also available. After months of searching for an executive director, the Soo Theatre Project Board of Directors is happy to announce that they have hired Jack Bradway. Having received an MBA in Arts Administration from the University of Wisconsin-Madison in August 2006, Bradway is happy for the chance to work on the historic theatre renovation. The Soo Theatre Board realized they were at a point where they needed someone to work on fundraising, not only to continue work on the theatre, but to generate revenue to pay an executive director. A dedicated board member made the generous offer that allowed the board to create the position. The Patrick Egan family is underwriting Bradway’s salary the first year. Raised in Munising, where he was graduated from high school in 1999, Jack is thrilled to have a position not only in his field of expertise, but also in the Upper Peninsula. He earned his BS degree with highest honors in Business Administration from Michigan Technological University, Houghton in May 2004. The new director will begin work at Soo Theatre July 1st. His last position in the arts field was at Ten Chimneys foundation in Genesee Depot, WI, where he was development manager for a world-class museum, the former home of Alfred Lunt and Lynn Fontanne. He also successfully coordinated Wisconsin’s largest annual weekend arts festival for the Madison Museum of Contemporary Art from 2004 to 2006. 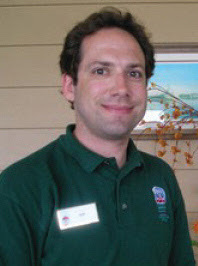 Bradway has held a variety of jobs during his college years, giving him a good foundation for the job at Soo Theatre Project. Jack, welcome to a great project and a terrific community!